Ripley’s Believe It or Not! 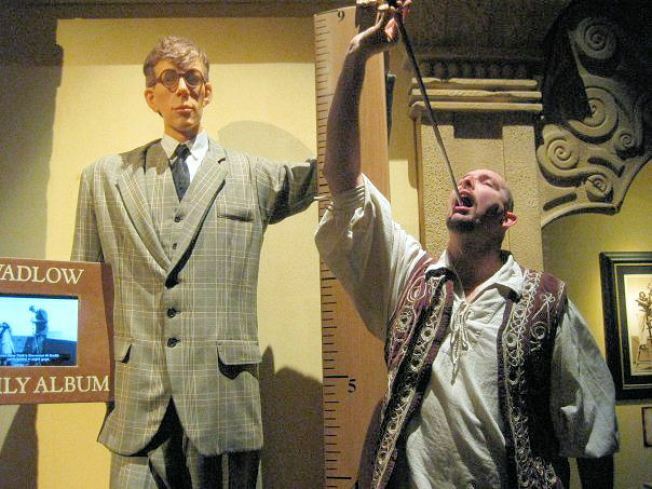 Odditorium will host a free sword swallower show on Saturday. You might not know it, but February is National Swallowing Disorders Month. And if that makes you go "ehhhhhhh," here's something to make you go "ahhhhhhhhhhhh." National Swallowing Disorders Month and Sword Swallowers Day are intended to "promote this ancient art that is still being carried on by a few dozen surviving practitioners, to raise awareness of the medical contributions sword swallowers have made to the fields of medicine and science, to honor veteran performers, and to correct misconceptions and educate the public and medical professionals," according to the Sword Swallowers Association International. The New York show will feature the work of Todd Robbins, Lady Aye and Donny Vomit.